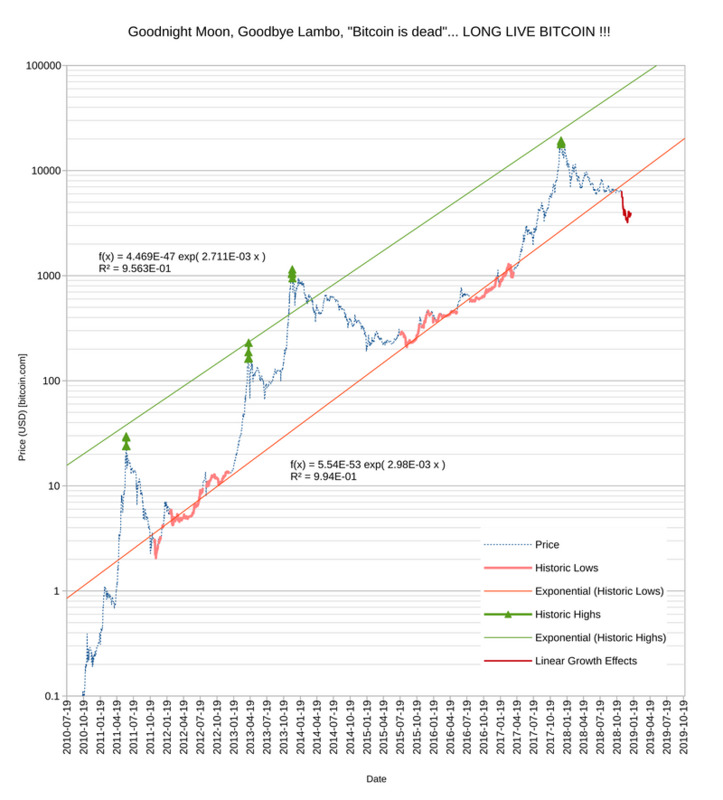 In November of 2018, the price of BTC broke downward out of a six-year pattern of exponential pricing. It is now trading at a steep discount (roughly -30%), compared to the lowest levels established in similar cycle periods (those with somewhat rational prices and multiple working exchanges). As an emerging protocol, bitcoin promised exponential growth in: adoption, network capacity, price and hashrate. The distinguishing feature of bitcoin used greed as the hook to engage CPU power & users in a technology that became a new economic paradigm, much more than a simple ponzi scheme. Metcalfe's law dictated that the value of the network would grow as more people participated fully. However, after handicapping the on-chain network with 4X growth in as many years, the BTC fork has finally broken a very long pricing pattern and users are now comparing their linear laments to exponential expectations. The social attack employed by the BTC fork has been manifold. First, a hard on-chain blocksize limit, then mass censorship on social channels, pushing out developers, market manipulation and stifling competing forks. The last bastions of the bellweather BTC fork were it's dominance in novel economic arenas: price and hashrate. It seems that price is just now coming into alignment with the network capacity and that hashrate will quickly follow, as it does. The driving factors of adoption are being manifested in the markets. It is becoming more clear that BTC is not what users signed up for. BTC has become marginalized rather than mainstream and will level off prematurely. This is likely the beginning of the end for BTC. Long live bitcoin. More technical analysis coming in 2029! RE: The long game of the BTC is now evident in the market. An autopsy. I agree with everything but you failed to mention that all the limiting factors applied to BTC are artificially imposed and can be lifted at any time. The most important factor that will keep btc dominant over bch is that the benefactor has remained anonymous and benevolent. My prediction is that as soon as bch seriously threatens btc as a global currency the restrictions placed on the btc network will be dissolved, allowing it to resume its previous trajectory.